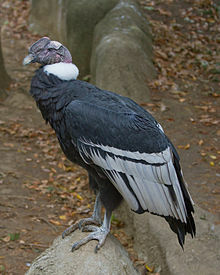 The Andean condor (Vultur gryphus) is a Sooth American bird in the New Warld vultur faimily Cathartidae an is the anerly member o the genus Vultur. 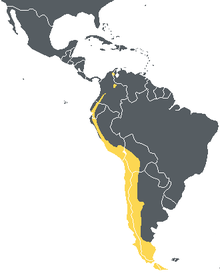 Foond in the Andes muntains an adjacent Paceefic coasts o wastren Sooth Americae, the Andean condor is the lairgest fleein bird in the warld bi combined measurement o wicht an wingspan. It haes a maximum wingspan o 3.3 m (10 ft 10 in) exceedit anerly bi the wingspans o fower seabirds an watter birds—the roughly 3.5 m (11 ft 6 in) maximum o the wanderin albatross, soothren ryal albatross, great white pelican an Dalmatie pelican. ↑ BirdLife International (2012). "Vultur gryphus". IUCN Reid Leet o Threatened Species. Version 2013.2. Internaitional Union for Conservation o Naitur. Retrieved 26 November 2013. This page wis last eeditit on 30 Mairch 2017, at 04:49.